Questions on off grid systems - General Discussion - Drive On Wood! 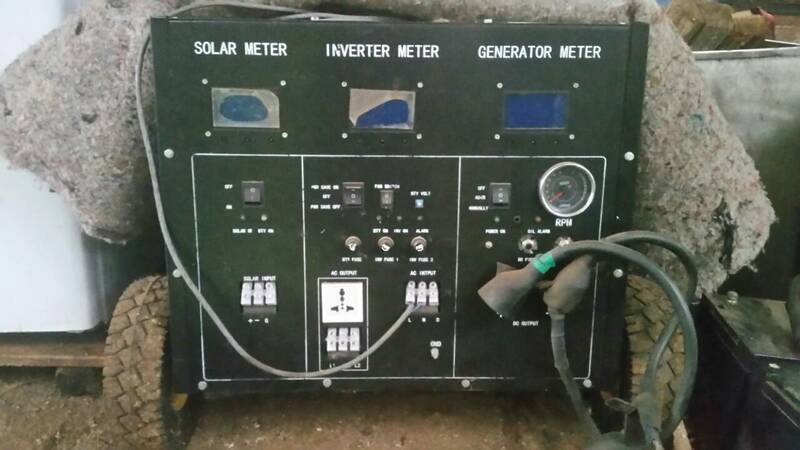 I reference Jehu Garcia, Peter Matthews, and Handeeman who have house batteries and electric cars from salvaged electric car modules and laptop cells, who don’t use BMS and over years of use don’t have cell unbalance issues. I believe they hand select matching cells and then periodically monitor their pack voltages to prevent problems. This is an interesting example of a Tesla model S having a battery fire seemly for no real reason. And keep in mind they have both a BMS and a thermal cooling loop. A DIY lithium battery pack has real risks involved. The only real advantage I see for lithium is weight for mobile use. The plant I retired from had about 50 electric forklifts(36v), the drivers abused those batteries daily, they would run them till the lift would barely move(10-20%) in almost 10 yrs we never had to replace a whole battery, individual cells, now, and then but that’s all. So it’s not hard for me to believe getting 15-20 yrs. with proper maintenance. Forklift batteries have solid plates, I think. That is why they can withstand abuse. They are actually rated to be drawn down 70%. Another advantage is they can be free if one finds a good source of laptop cells. Frank I have never really had much to do with electric fork trucks. But I do know the biggest failure point on a car battery even deep cycle batteries is the connection point between the actual terminal on the battery and the first plate. They are designed to last about 5 years before the post separates from the plate. Someone who had done alot of research back in the 90s told me that with respect to the solar car we had at college. That professor claimed that forklift batteries are built with a much better plate to post interface and that has alot to do with their longer life. So you are probably onto something with them I just have no experience with them myself. We looked into lithium and found a company we liked. We still have not found a client yet for said pack due to the price difference. If you size a lead acid bank for 30 percent depth of discharge and a lithium bank for 70 percent depth of discharge (which is what the lithium folks suggest) the lead acid beats it on price even with a midlife replacement. As mentioned above the amount of cycles you get is directly dependant on depth of discharge and the relationship is not linear. If anyone does go lithium stick with the lithium iron phosphate chemistry to avoid insurance issues. That rules out tesla packs unless insurance isnt an issue or you mount the pack in a dedicated space. As to battery management outback midnite solar and schneiders off the shelf charge controllers will work for lithium charge profiles. You will still need a battery management board but they are available in any voltage configuration you are likely to encounter in off grid. My personal feeling is when the salvaged lithium car banks start hitting the market the new lithium prices will fall. I assume I will install one more lead bank at home then go lithium or lead carbon which is another contender. No nckel iron for me unless I score some old Edisons. I would really like to try the nickel/iron, but when I got the price direct from Chinese factory it was more than I’m willing to go for an unproven Chinese product. With out all the tariffs, and other added costs they quoted $7700.00 for 800ah. If I could find an affordable source for nickel and iron plates I would build my own. David is anyone offering the lead carbon battery? I saw something about them and they looked really cool. Here is the video I saw and thought these things should be in every car they would be a big improvement at a small cost. Robert Murray Smith has another series of videos up there about an experimental all carbon battery he is currently building a prototype of to test in a small car. I think it sounds like really cool technology but probably a long way off he is a very small company in England so I don’t expect to see his battery here any time soon. They have products they are out I don’t know much more then that right now. The tech needs to mature for a while I think. Right now it’s aimed at high end rv and marine applications so early adopters. My understanding is the carbon layer spreads the heat which spreads the charge more evenly on the plates leading to less spot wearing which causes cell failures. There is a lot of flowery marketing in the write up so be sure to wear your skepticals/spectacles. There is a lot of interest in marrying carbon to lead in various ways. Lead is not dead. Agreed dan up to a point. There are a lot of advances in material science in the last few decades and a tonne of money in energy storage for cars and stationary. The humble lead acid was fine for decades but now it needs to up its game. All those manufacturers don’t want to go out of the game so they are investing heavily in research some of it will pan out. To illustrate the above point a timely article. David I agree up to a point. Having been a controls engineer who designed a few production lines I can tell you alot if the changes they are talking about won’t require total retooling or new production lines. Panasonic is making alot of changes to the battery chemistry to remove cobalt from the batteries but doing it on the same lines for example. The most interesting development to me recently is the polymer electrolyte for lithium ion batteries. If Mike Zimmerman is correct and he is definitely putting his bet foot forward we will see lithium batteries in both cars and storage for a long time to come. He claims with good reason from what I have read to have extended the life span removed the fire risk and made the lithium battery much lighter all while being able to just swap the electrolyte while using existing manufacturing equipment. Hi all, does anyone know anything about Power Jack inverters on Ebay? They get mixed reviews. I am looking at 10k inverters. The latest Powerjack units are a million miles from the early junk they shipped out , these new units are much better at standby current and will take a hefty over use for short time spells without too much damage , they also use VERY heavy torroid transformers . i give mine the thumbs up for price ,the ups side works well if you want that part of it , and the battery charging side also works well for me , all be it a little less than the advertised 100 amp , but then again maybe i never take my batteries down that low they can accept the 100 amps , oh well still a bargain as far as mine go . Ignore the fancy LCD screen telling you how much power its making or saving ect as its not really uesfull , what it really needed was a amps output /input and voltage input /output , i just bought cheap power meters and shunts from ebay in the end to do that job . If you can grab one of these i would highly recommend it , PowerJack call it a smart charger .